Polycarp had only been a child when he had been introduced to the man by the name of John yet he knew that this man was important. He gave him his attention because his parents seemed to be amazed at the man and when he did this he began to hear John speak words that amazed him. Soon, Polycarp had converted to the faith of John the Apostle and had become a follower of John’s Lord–Jesus Christ. Further, he began taking teaching and guidance from John in how he might also be a man of God who faithfully pursued God’s calling upon his life. He never was a philosopher or an especially educated man but he had the benefit of spending much time with not only John but also Papias and Ignatius of Antioch. Soon, he was a leader within the Church–even without a philosophical education–in one of the most trying and challenging times in the history of the Body of Christ. It seemed that all who wanted it could claim to be the true Church that was established by Jesus. There was no clear distinction what was and wasn’t orthodoxy and many were led astray by teachers who, knowingly or unknowingly, taught their opinions as Jesus’ opinions. Polycarp relied upon the teaching and guidance he had received from John to discern right teaching from wrong teaching. Then, he used his natural gifts and talents to teach and guide others to avoid heresy. In this way, Polycarp was father to many. One of the men that Polycarp taught and mentored was Irenaeus who would go on to grow Polycarp’s investment of time and attention by guiding the Church through another challenging and nebulous time of his own. Polycarp’s love for Irenaeus quite literally changed the world even if Polycarp himself never saw or knew it. Looking back, this kind of love and devotion is what differentiated Polycarp from his opponents. While there was much argument it was not always full of love and compassion. 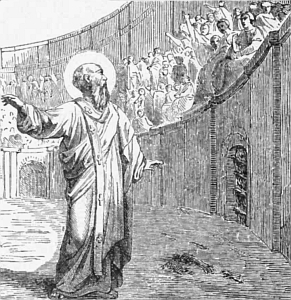 Polycarp on the other hand seemed to be genuinely affected and transformed by the faith that held him. He was not brilliant or well educated but he was sincere and loving and this lent weight to his arguments. The marks of transformation on his life suggested that he had truly consumed and been sustained by the Bread of Life and the life-giving water of Jesus’ teaching. When he told the story of what God had done in his life people were inspired to hand their lives over to the same God he followed. He led by example and not simply be beautiful, rhetorical flourishes. When he was an old man (as old as ninety years by some estimates), he was arrested for being a Christian by a government that was growing increasingly hostile to those who were devoted to another power. On some level he had seen this coming for Ignatius and John had already been murdered for their faith. He was accused of being Christian and, ever sincere and honest, he gladly admitted that he was–he could see no reason to be ashamed for his faith. They gave him an opportunity to deny his faith in public or be executed. He responded: “How am I supposed to blaspheme my King and Savior? Do whatever you will.” They did whatever they willed by building a large pyre of sticks and flammable items. They tied him to the top of it and prepared to drive nails through his body so that he might not escape. He smiled at the worker and assured him: “Don’t worry about the nails. The God who gives me strength to endure the fire will give me enough to sit still without your help.” They didn’t nail him down but they must have expected him to cry out once the pyre was lit. Yet, he didn’t. Instead, it seemed that he was unscathed by the flames as he prayed and sang hymns. The crowd looked on amazed and many would be converted because of this sight but his executioners were enraged that he didn’t have the courtesy to die screaming like they had hoped he would. Finally, they stabbed him in the chest with a dagger and he died as a martyr.